Die nächste „World of Adventure “ von Evil Hat ist gestern erschienen. Rise up against the Masters of Umdaar! Behold the fallen world of Umdaar, home to savage warriors, cyborg insects, and merciless warlords. Oh, and lasers—lotsand lots of lasers. The Masters rule with an iron fist, and the people’s only hope are the archaeonauts and their quest for long-lost artifacts of power. But will the Masters get there first? 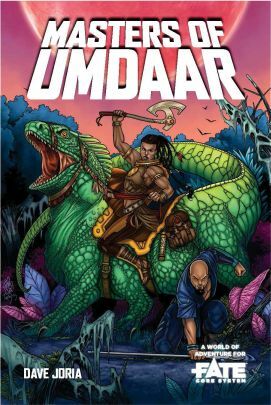 Masters of Umdaar, our latest Fate World of Adventure by Dave Joria, is a retro tribute to such shiny serials as John Carter of Mars, Flash Gordon, He-Man, and Thundercats. Der Beitrag Fate World of Adventure: Masters of Umdaar erschien zuerst auf FateRpg.de. Weiter Nächster Beitrag: Goblinbau: Was die Goblins so machen? Larp!